I bought a few tea flavours from Alokozay Tea’s online store to test out my recipe. A lot of items are eligible for free delivery but your purchase must by over $39. Since my purchase was over $10, they hooked me up with a free mug! If you prefer going to a physical location to purchase Alokozay Tea, they are available at Bulk Barn (across Canada) and in Ontario at Metro (International Food aisle), Food Basics, and Adonis. I checked-out with Lemon Tea (black and green), Early Grey, and Cinnamon. Since I was cooking fish, I thought using the Lemon Tea in my stock would be the best match. 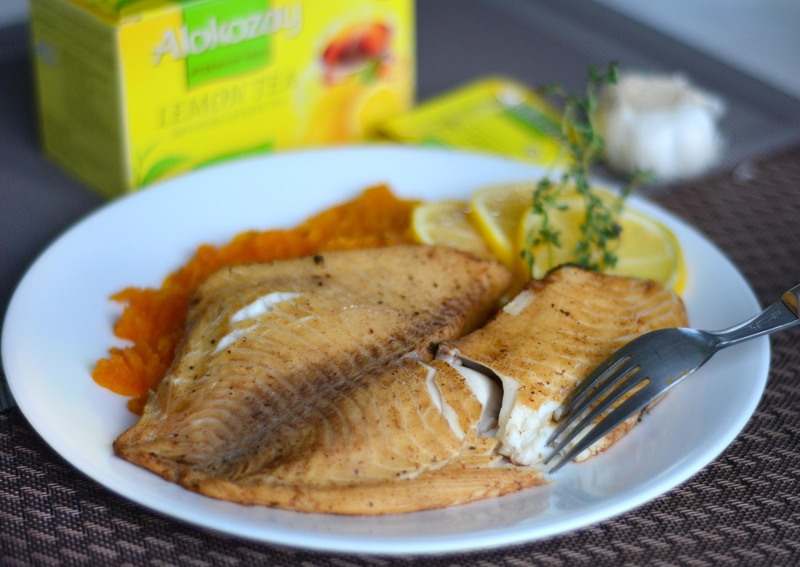 If you’d like to follow my recipe to a tee, use this Alokozay Coupon and receive $1.00 off any Alokozay Tea product. 1. Use a pot/skillet with a lid large enough to fit the fillet. Fill it with enough water to fully submerge the fillet. 2. Toss in tea, garlic, onion, thyme, salt, and pepper. Boil and steep for 5-10 minutes on high heat, covered. 3. Turn the heat down to a simmer and carefully lower fillet into pot/skillet. 4. Turn off heat and let it steam for 1 minute. 5. Be extremely delicate when you lift it out of the pot/skillet. I used 2 spatulas to it out. Season with salt and pepper, and serve. I served mine over mashed sweet potato. You can also serve it over rice, pasta or some roasted veggies. The tea in the stock gave it a beautiful colour that contrasted with the silky white meat on the inside. Since I lightly poached it in water, it was hard for me to over cook it! Give it a nice squeeze of lemon juice and the flavours will shine. Some of the products used were provided by Alokozay Tea, opinions expressed are my own.